I'm so excited to be part of the IHAN Machine Embroidery Blog Hop. I'm a hobbyist and not a professional and I love creating items to give away or sell for charity. The quicker and easier things are, the better. That's why I love working with complete embroidery designs in the hoop when available. 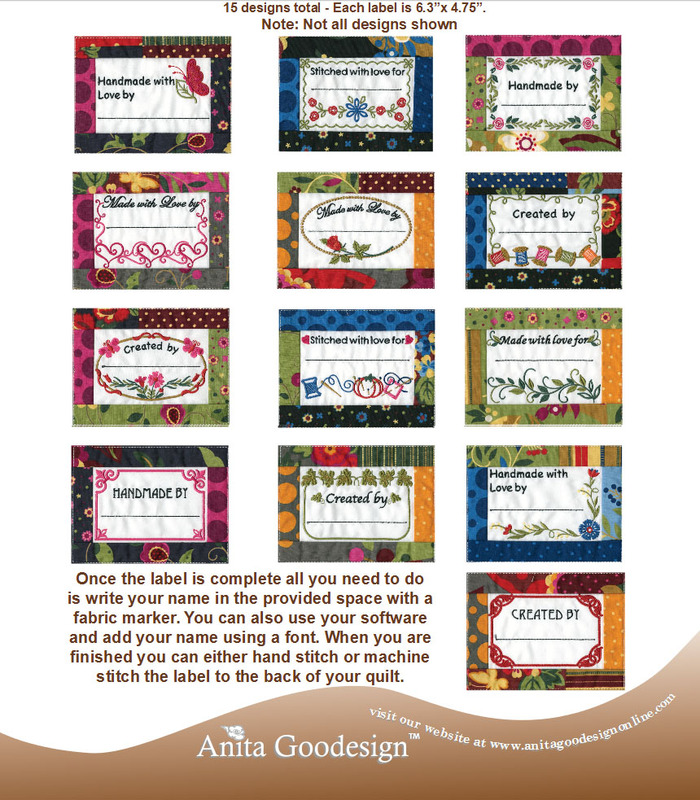 When I saw Anita Goodesign Machine Embroidery files, it was difficult to choose which design to stitch out. There are so many great options to choose from. 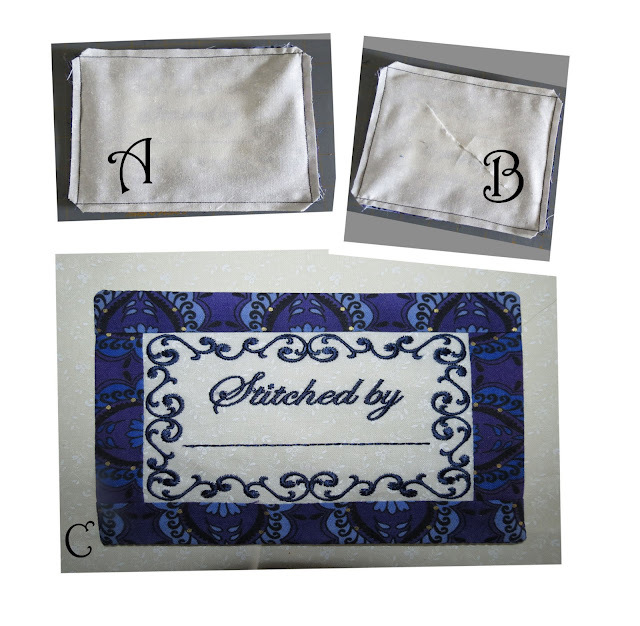 When I was asked to participate in this blog hop and choose a design to participate with, I was drawn to the beautiful labels available to embroider. I am so guilty of not always placing a label on my quilts. We all know this is such a no no. So, I figured if I could churn out a few pre-made labels, I might be more inclined to place a label on a finished quilt. For today's blog hop, I've chosen the Folded-Fabric-Quilt-Labels to complete. 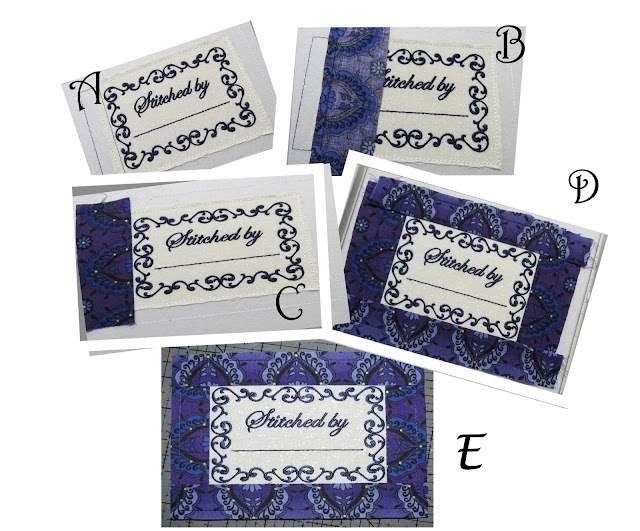 When you purchase the set, you receive 15 different quick designs to stitch out. Below is my favorite one. Don't be afraid to stop your embroidery machine and change colors mid stream. Even though a piece may be designed as one color, you can stop and switch colors and then let it continue on. Unless you are doing contest pieces, just enjoy the process and go with the flow. If the thread breaks, OK, back up a few stitches and restart. If it keeps breaking... cuss a little and keep going. If the stabilizer is not sticky back, I'll use the 505 Temporary adhesive spray to help keep the fabric pieces in place. If you have questions on anything, please feel free to email me! D. Finished stitching the label as designed. For each side placed, the embroidery stitching will stitch the outline of the side, then you place your fabric piece right sides together towards the center. 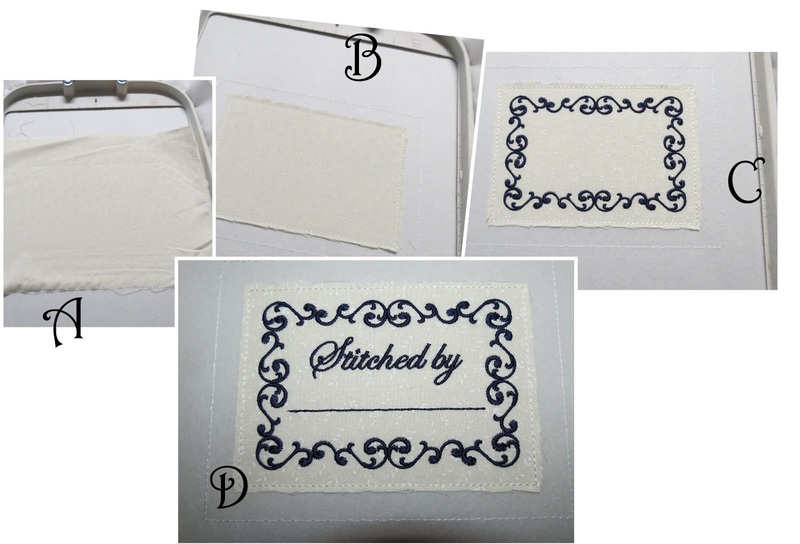 The embroidery file will stitch down your fabric side with a single line stitch. Then you fold back for right side up. Give it a little press and move on to the next side. A. Left side size stiched out. B. Left side stitched down with single stitch line. C. Left side ironed back for right side to face up. D. All four sides completed. E. All stitched out and cut from the backing. For my labels, I like to use both fusible webbing and stitch down the sides. In order to do both, it's easier for me to put a backing on the label so the sides have something to stitch down. A. I add a backing to the label. To start, I place the backing right sides together to the front side of the label and add a 1/4" seam all around the sides. When completed, I snip off the corners for easier turning. B. Next, carefully lift the backing from the front of the label and snip a slit in it to turn the label right side out. C. turn your label right side out and then press flat. 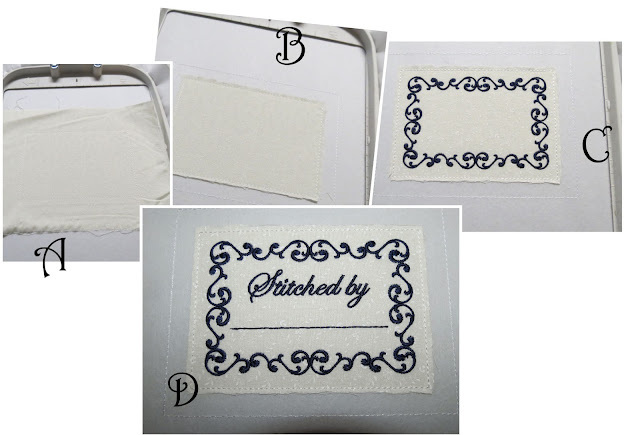 Now you can add your fusible webbing to the back of the label plus stitch down the sides. If you would like, you can just stitch down the sides. From here, grab your favorite permanent fabric pen and customize your label! From the label set, there's 14 different additional options to stitch out. Take a look at some of the others included! Very nice tutorial. Thanks for sharing. love the idea of turning it inside out, I always embroider my labels too but just iron over the edges, this is cooler!! I NEED these! I'm a label procrastinator and these are great designs. I love how you finish them. Thanks for sharing! Great post Trish. You shared one of the tips I am sharing, but that is okay. I learned a couple of things from your post too. I have an embroidery machine, but never got lessons, so haven't used it. I love the idea of making my own labels, so need to learn how to size letters and shapes to make them. Love the labels. I like to label all my quilts. Thanks for sharing. Love the labels. I am just getting into using my embroidery machine, and am looking for ways to add embroidery to my quilting and sewing. This is a wonderful way to finish them off. Thanks for sharing and for the opportunity on the draw. When I flip the labels right side out, I've even pushed some fusible webbing in the slit on the back to fuse the front of the label to the back. (so the front can't be cut off). Then add another piece of fusible webbing to the back to adhere it to the quilt. If I'm really determined, I'll whip stitch around the edge too. That label should stay longer than the quilt lol! Gave me some great ideas for labels! I hate to make them, so this is very helpful. I never put labels on my quilts. There are only a few quilts I'm proud enough to put a label on. Most of them I really don't want traced back to me. Think I'll make up a few labels for those quilts I really like. These look so cute Trish. I'm not good about adding labels to my projects, but this design collection makes it look so easy I think I'll start. What a neat idea on the labels. I've never put fabric on the sides before. I like that idea. Do you even put labels on quilts you are going to sell? Thanks for sharing and for being in the hop. That is a great way to stichout a lot of lables to have on hand. I some times forget to lable my quilts, put all my quilting friends will always call me up to make them a lable for theirs. Hmm!! Why is that? Well at lest now I will have a new way of making lables. I love it! I have been wanting to get that design and just haven't yet! I did pick up my march designs and am excited to try to get some stitching done this week. Love to embroider my quilt labels and I do use my software to add my name, etc. I must remember your idea to add a back to the label and then turn right-side out; excellent finishing touch! Thanks, I added 1/4 inch on all sides to add the backing and turning it right sides out, mine ended up 4.75 by 6.25. Those are really cute label designs. thanks for sharing your techniques! What a great idea. I am so glad to have found your blog site. Thanks for sharing. Love the labels. I use 505 also. Thank you Trish. This is a great idea. Very nice! I am a label procrastinator too~ this might be the kick I need to make labels too! Loved the ME tips! Thanks! Very nice tutorial. Thank you for sharing. Thanks for sharing the tutorial on the labels. I like to put customized labels on my quilts and these are great. Those are great labels...nicely done. I always hate having to make a label, but these look like doable fun. Thanks for sharing! Trish your labels are beautiful. That is a great idea to make some up in advance so there isn't any excuses for not labeling our work. I really like the other options provided on the design software as well. Thanks so much for participating, I've been inspired! I like your label, and all of them in the collection. And yes, it would make me be better about labeling my quilts too. I do always label those I giveaway, but the ones I keep....not so much. A great idea and I had not seen this collection before, so something new for me! Thanks. Thanks so much for all the tips and never thought I such beautiful labels..
Trisha these look wonderful. Thank you for being in the hop. Someone once asked me why I think labels are important to put on a quilt. My answer was "Artists always sign their painting, potters sign their creations, cartoonists sign theirs too- I think my quilt is a work of art and I am proud of what I achivesvjustblike the artist, potter, and cartoonist!" Great job! Thanks for the tips! Thank you for the great tutorial. I like to embroider my labels for special quilts, but this would be fairly quick and easy to make all of my labels. Thanks again for the tips. Trish - what an "AHA" moment for me with the way you turn the labels. I've been leaving an opening on the side and of course it's always just a little off. Thank you so much for the tutorial. Thank you for the tutorial! I am aware of the importance of quilt labels, but have yet to do one. I have mostly done mini and wall quilts but even these need a label! thanks for the tutorial... I have been wanting to get these designs so I can make my own labels. These labels are so cool, Trish! I didn't even see these designs when I was looking through the Anita Goodesign site. These would be great not only for quilts, but for other handmade items as well, like bags, baby blankets, clothing items, etc. Wonderful utilitarian labels! these I can do! Thank you for the fabulous post - I will have to get this design collection - you made making the labels look so easy...thanks for the photos and the tips! Love the labels. I think labels are the most forgotten piece of a quilt. I know most of mine do not have labels. With these ME labels I like that they are pretty but also leave a spot for handwriting your name/info. I like to think that way in the future someone will enjoy seeing the handwritten part. I had no idea there were so many bloggers interested in ME! Love anita goodesign! Thanks for the fun here on the hop! Your tips will be useful! I have just started embroidering labels for my quilts. Thanks for the tutorial!